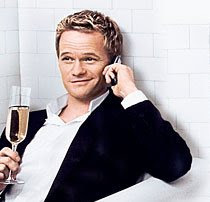 Like many people last night, I called Barney Stinson during the Super Bowl, and got the same pre-recorded message that everyone else did. Of course, I knew that it was going to be some kind of tongue-in-cheek ploy to advertise How I Met Your Mother, but I couldn't help myself. As much as I rag on HIMYM for its declining quality when it comes to the actual show, I do have to admit that they really know how to advertise. The pre-recorded message was a good one, but nothing beats the real-life Wikipedia entry the show created for Barney's alter-ego, Lorenzo von Matterhorn (from "The Playbook"). Unfortunately, the latter was taken down pretty quickly, but it was epic while it lasted. While I do wish the show was still fresh creatively, I am glad to see that they're at least putting some time and effort into marketing the show in unique and fun ways. For the first time in a long time, I might actually have to watch tonight's How I Met Your Mother instead of Chuck. Sacrilege, I know.